Over the past several years, stand mixers have become a staple in the kitchen. While their permanence on the counter makes them quite convenient, sometimes the portability and easy cleanup of a handheld mixer is the better choice. If you are reading this article, odds are, you are looking to purchase a hand mixer. But searching through the available options to make a well-informed decision can be overwhelming and time consuming. We’ve done the research for you and compiled our list of the Top 10 Best Hand Mixers of 2017. Below we have rounded up our top 10 and detailed information about each hand mixer, what we love and joy features about them. The technologically-advanced design and sleek look of Cuisinart products have made the brand a favorite among amateur and gourmet cooks alike. This handheld mixer is no exception. With 9 speeds, digital display and swivel cord, the Power Advantage Plus is an asset in any kitchen. This set includes 2 beaters, 1 chef whisk, 2 dough hooks, 1 spatula, a recipe/instruction guide and a BPA-free storage case. Able to hold the mixer cord and all of the accessories, the sturdy case snaps onto the mixer for easier and more convenient storage. The Cuisinart Power Advantage Plus also comes with a 3 year limited warranty. The ingenious designers at OXO solved a handheld mixer problem you probably didn’t even realize you had. The OXO On has a headlight that surrounds the beater insertion area. When the headlight is on, it lights up your entire bowl, allowing you to avoid splatters and make sure everything is incorporating properly. 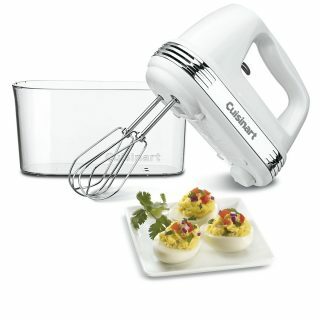 This mixer has six speeds with a digital control and comes with 2 beaters and 2 dough hooks. The beaters snap onto the lightweight mixer body for easy storage. It also has a flat base to allow the mixer to stand upright. KitchenAid is the company that revolutionized stand-alone mixers. 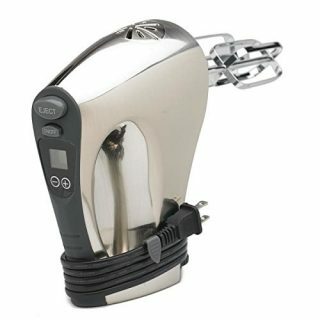 The design elements that made those small appliances so popular can also be seen in their handheld mixers. 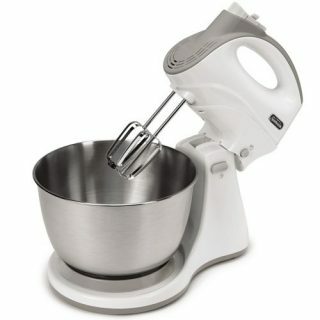 This soft grip handled, 7 speed mixer has KitchenAid’s unique Soft Start feature which gradually increases the mixing speed regardless of the speed you have selected. This attribute greatly reduces splatter as the blending process begins. One sixteen tine wire whisk and two stainless steel Turbo Beater II accessories come with this mixer. Other attachments, such as a blending rod and dough hooks, are available separately. Like their other small appliances, the KitchenAid KHM7210 Handheld Mixer comes in a variety of colors to complement any décor. This handheld mixer from Hamilton Beach is a fantastic choice for budget-minded shoppers. With six speeds, it also features a Quick Burst button to give a small boost to your selected speed. The mixer is specially designed to balance on the side of the bowl to easily add ingredients without adding mess to your counters. A snap-on storage case holds the mixer cord and the included whisk and two beaters. For nearly one hundred years, the Betty Crocker brand has been synonymous with baking. Their handheld mixer has the modern features of a 21st century blender combined with the look of their classic 20th century blender. 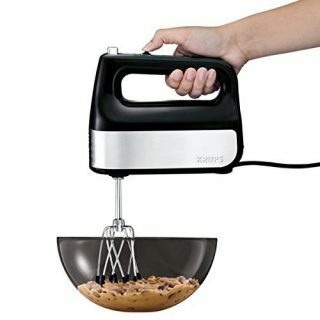 Complete with 2 wire beaters and 2 dough hooks, this lightweight, budget-friendly hand mixer has 7 speeds. The Power Burst feature gives the mixer a little boost in speed on all 7 settings. This Nesco mixer has the most speed options of all the handhelds on this list. The 16 speeds are managed by a digital control with a back-lit LED screen. This mixer also features a built-in timer to make following recipes easier and more precise. A rubberized handle provides a more comfortable grip. For easy storage, the cord wraps and clips to the mixer body. 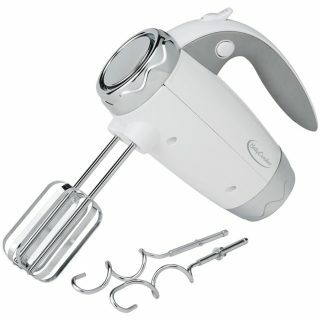 The Nesco Hand Mixer comes with 1 set of standard chrome plated turbo beaters. This Oster Handheld Mixer is budget-friendly option that is full of features. This 6 speed mixer comes with Oster’s Clean Start, which gradually speeds the mixer up to your desired setting. It also has a Burst of Power that will give a boost to your current speed. 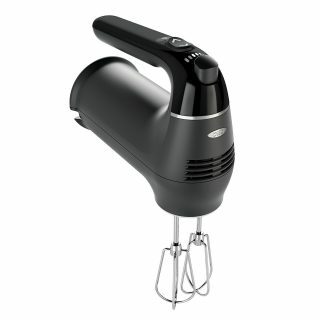 This mixer comes with 2 chrome beaters and a wire balloon whisk. The bottom of the mixer is fitted with a heel rest to keep it in an upright position while you add ingredients. The retractable cord makes storage a breeze. This lightweight hand mixer from Krups has 10 speeds and a turbo boost controlled by a sliding button. The designers at Krups included a pause button in this mixer’s timer feature because they know just how much multi-tasking goes on in the kitchen. 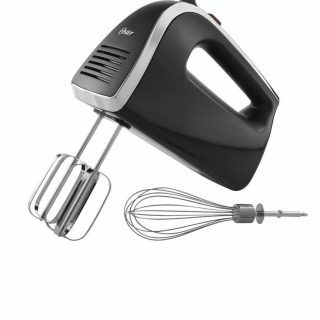 This handheld mixer set includes 1 whisk, 2 dough hooks and 2 silicone coated beaters. The silicone on the lower portion of the beaters scrape the bowl as you mix and greatly reduces the noise of the beaters striking the bowl. A compact storage case that snaps on to the mixer body is also included to hold the accessories. This Sunbeam mixer combines the best of both mixer worlds. This versatile 5 speed mixer can convert between a handheld and stand mixer. By pushing a release button on the hinge of the stand, you can easily lift off the mixer. For those times you need an added boost of speed, this mixer features a Burst of Power button. This Sunbeam combo includes 2 chrome beaters, 2 dough hooks and a 3-quart stainless steel bowl. The bowl is removable from the base for use with the hand mixer and for easy clean up. The Breville Handy Mix Scraper is the most luxurious mixer on our list. This mixer features Beater IQ, taking the thinking out of mixing. With this technology, the unit detects the attachments you have inserted and adjusts the speed to the proper range needed. 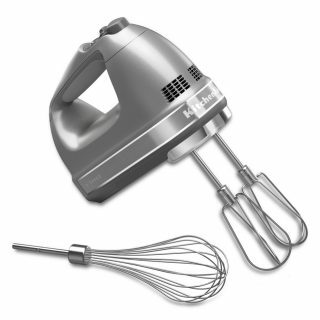 Two balloon whisks, two dough hooks and two scraper beaters are included with this mixer. The scraper beaters are tipped with silicone to not only scrape the bowl as you mix, but lessen the noise. This mixer also has a timer that counts up instead of down to provide more accuracy and an automatic light that illuminates your bowl. A plastic case that holds all the attachments and clips under the unit for easy storage is also included. 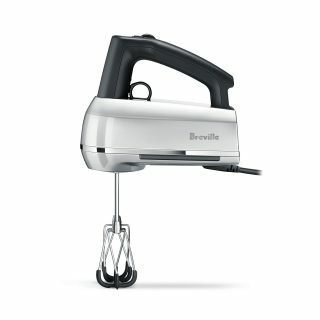 With a swivel cord and a non-tip heel rest, the designers at Breville have thought of everything. 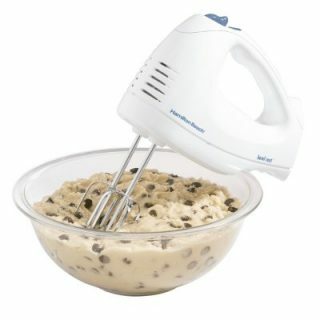 This hand mixer also comes with a 1 year limited warranty. A new hand mixer can have you whipping up exciting recipes in no time! With mixers for every budget and desired feature, we hope our list of the Top 10 Best Hand Mixers of 2017 helped to make your decision easier.